Working abroad is a tough choice. We all know it is not easy to leave our loved one behind and see them physically once or twice a year because of works nature while in other countries. Applying for jobs abroad also need money to process your passport, documents, medical exams and other requirements. 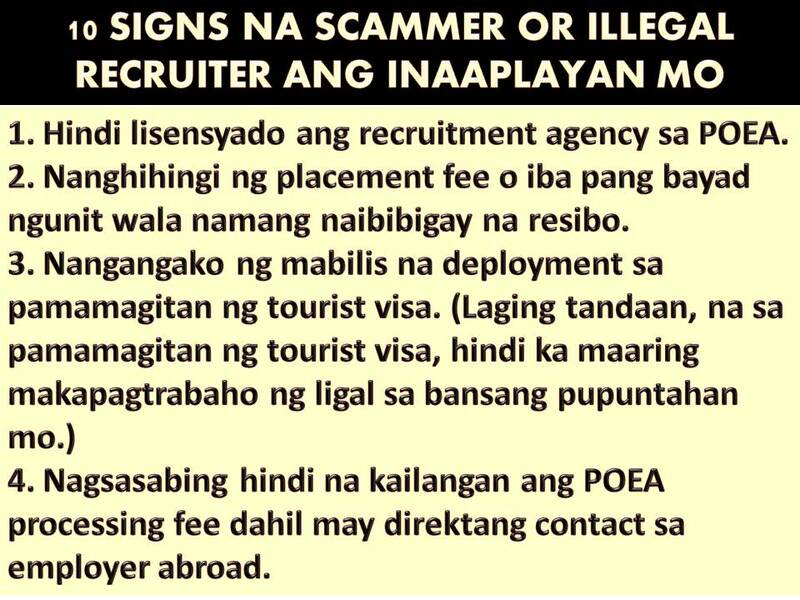 This is why it is important that an applicant abroad you are applying in legit recruitment agencies and not with scammers. Scammers are everywhere nowadays especially on the internet where fake job vacancies spreading like a wildfire. 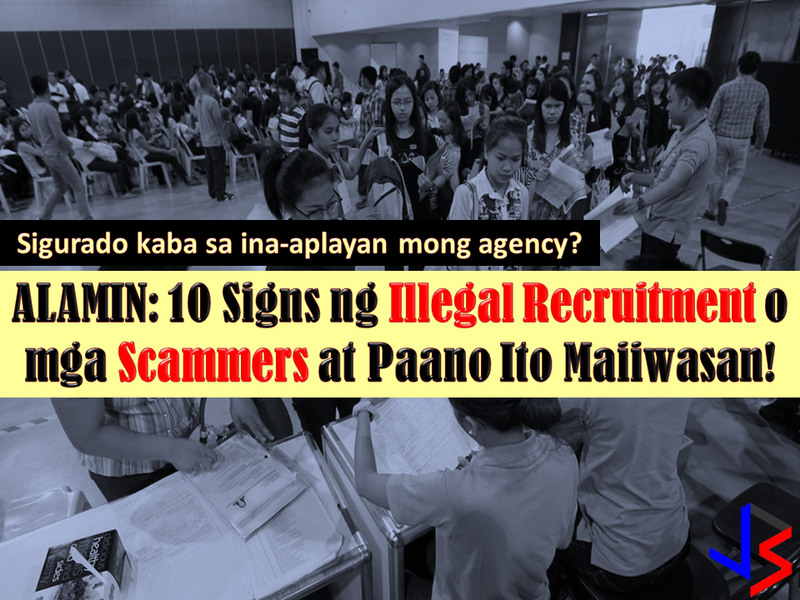 With this, it is important to know on how to spot or avoid illegal recruitment. 3. Check the registered office address of recruitment agencies. 5. Always remember that the recruitment fee or placement fee is only equal to one month salary and should be paid after employment contract is signed. Always demand an official receipt on whatever you are paying. 1. Jobs found on the internet that requires "immediate payment" to secure application. 2. Job ads and brochures requiring payments to a post office (PO)box. 3. Offers to work abroad through tourist visa. Legal job offers and provides authentic work visas. 1. 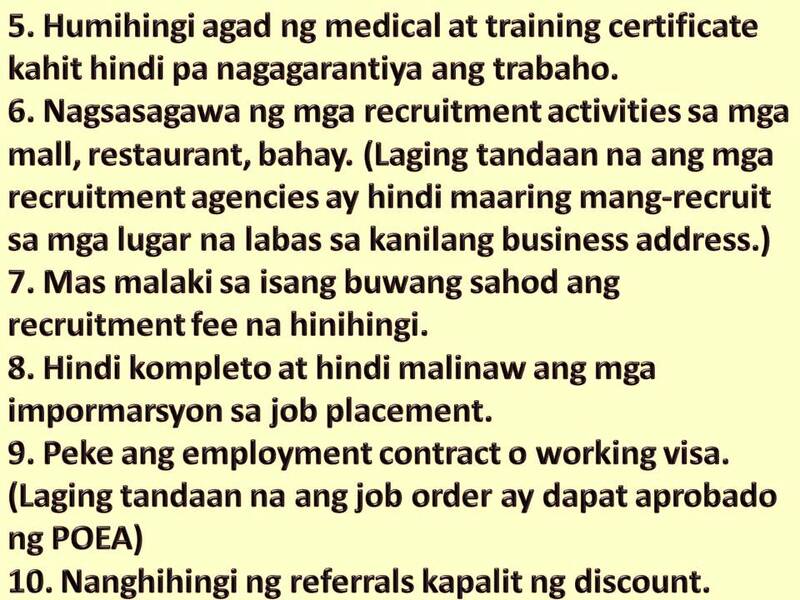 The recruitment agency is not licensed and not authorized by the POEA. 2. The recruitment agency is asking for placement or other fees but cannot issue an official receipt. 3. Promise faster deployment trough tourist visa. Always remember that through tourist visa, you cannot legally work in your host country. 4. Claims that POEA processing fee is not needed. Usually, the recruiter claims direct contact with employer abroad. 6. Conduct recruitment activities in mall, restaurants, houses. Agencies cannot recruit outside a registered business address. 7. Charges over one month's salary for recruitment fees. 9. False employment contract and or working visa. 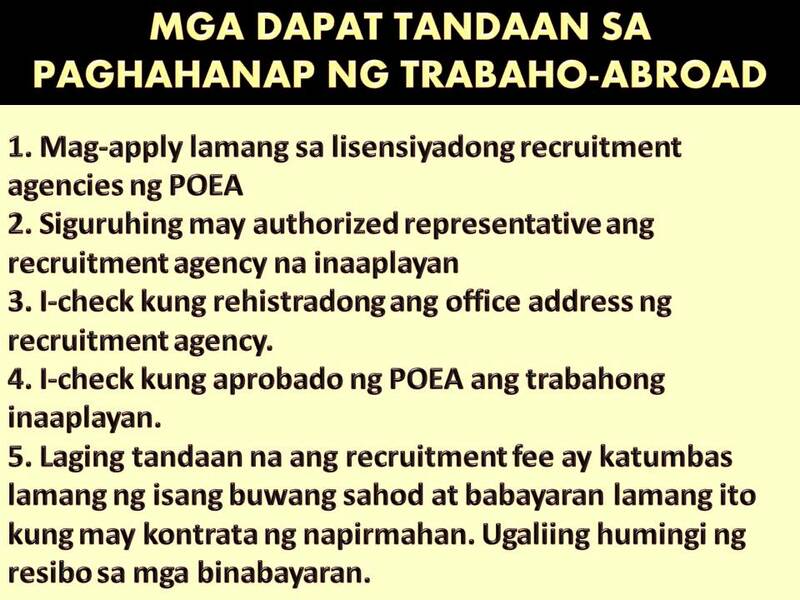 All job order must be approved by POEA. 10. Ask for referrals in exchange for discounts on fees. 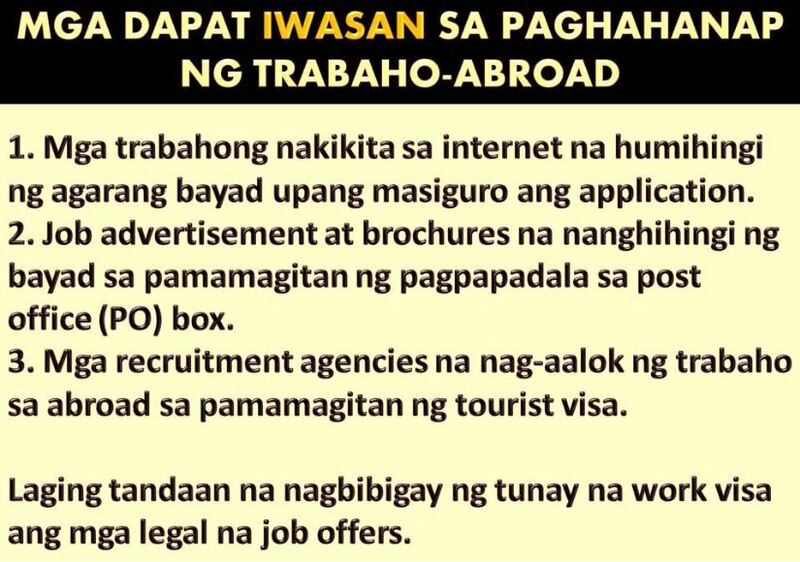 If you have doubts about the recruitment agencies where you are applying for a job abroad, you can check on this link from POEA. http://www.poea.gov.ph/cgi-bin/JobVacancies/jobsMenu.asp.